Here is an important breakthrough in understanding the symbolism of Shakespeare, the Bible and the nature of our true selves. It will astonish and excite lovers of Shakespeare - artists, performers, academics, theologians - and all those sincerely seeking spiritual fulfilment. As you read Shakespeare's Revelation you'll see, hidden in the allegories, symbols and metaphors, Shakespeare is repeatedly telling us how our soul has been deposed and imprisoned by our mind. Through his plays he hides the key to the door of our soul's prison. Grab this key with both hands! Paradigm Shift And Invisible Ink Portia and King Lear Shakespeare's Genesis Richard II Othello Macbeth Shakespeare's Gospel Merchant of Venice The Henries Shakespeare's Revelation Hamlet The Tempest Nothing about Shakespeare's genius has changed - but nothing will ever be the same again. 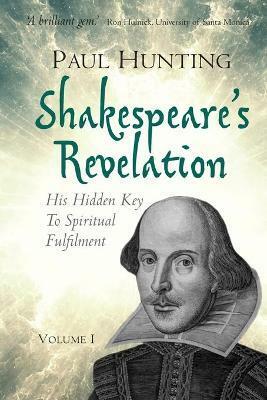 Acclaim for Shakespeare's Revelation H. Ronald Hulnick, Ph.D., President, University of Santa Monica, Co-author with Mary R. Hulnick, Ph.D., of Loyalty to Your Soul: The Heart of Spiritual Psychology "This is a brilliant gem of metaphorical, Spiritual connections between William Shakespeare and Spiritual Psychology. In thoroughly exploring Shakespeare's plays with wisdom, clarity, and wit, Paul Hunting masterfully demonstrates how the very human experiences in Shakespeare's plays are indeed "devoted to one thing-to remind us of our true spiritual nature as a loving soul." Hunting's insights and exegesis of Shakespeare, the Bible, and Spiritual Psychology principles can only serve to speed the world's Spiritual Awakening, as individuals find answers to two essential questions-"Who am I?" and "What is my purpose? "-in the reading of this fascinating book." Paul Kaye, D.S.S "Absolutely fascinating" Marjorie Salinas "Finally, Will makes sense! Thanks." Catherine Corona Ph. D. "This is amazing, Paul." Courtney Pierce "This is absolutely gorgeous. Thank you for undertaking such a task, Paul. You are clearly called by God into something truly great and wonderful. Wow. I'm in awe and inspired!" Cirelle Raphalian "So interesting! Thanks for parting the curtain." Stephen McGhee "What you wrote about is amazing! You are a true leader." Elisa Novick "Stunning!" Janis Fitzgerald "Soft stillness and the night become the touches of sweet harmony...Let's sit here and let the music fill out ears...even the smallest star sings like an angel in its motion...draw her home with music. Yes Paul - well done! Well done indeed!" Ann Webre "What an interesting idea! " Amy Bransky "Light, Loving, and Honouring to your tribute and expression" Heather Brown "Beautiful" Coco Rose "I love it!!!" Barbara Wieland "Paul. You have a marvellous way with words."